Simple, fast, and affordable online access. 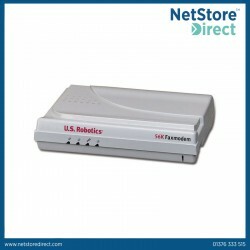 Get a USRobotics V.92 modem at an easily affordable price. The USRobotics 56K PCI Faxmodem utilizes the processing power of your home computer to make sending/checking e-mail and surf ing the Web easy. Update your home computer to surf the Web, send/receive e-mail, and take incoming calls while online with the ease and convenience of V.92 technology. Need to send a batch of digital pictures or other e-mail attachments? V.92 lets you send attachments up to 50% faster! Quick Connect lets you establish your connection faster, so you spend less time dialing up. You’re only seconds from surfing the Web! USRobotics Internet Call Notification (ICN) lets you screen incoming calls so you can take the important ones. (Call Waiting and Caller ID require service from your local phone company.) Modem on Hold lets you take calls while online without dropping your Internet connection –there’s no need for a second phone line. Great for home use! Your USRobotics modem is so easy to install and use, you’ll be up and running in no time! Our Quick Installation Guide makes installation as easy as 1-2-3. - Download new features as they become available. - Send faxes from any Windows application,and receive incoming faxes at any time.